The Internet is a great source of information these days… some of it conflicting. Take the name of this sweater: Isaura. Quite a few sites told me that Isaura (pronounced ee-SOW-rah) originated with the Portuguese, Spanish, or Late Roman, and indicates that one is from Isauria, a region in Asia Minor. On the other hand, an equal number of sites said that Isaura (now pronounced ee-SOR-uh) is from the Greek, and means “soft air,” or “gentle breeze.” Regardless of the actual origins of this particular word, here I prefer the Greek. This feminine cardigan is the perfect thing to pull on when the soft air of evening’s gentle breeze whispers against your skin. Though it’s rarely the case, here the delicate lace and cable stitches are fully reversible, making the shawl collar look exactly the same on the front and back sides of the fabric, so there is no awkward wrong side to hide. 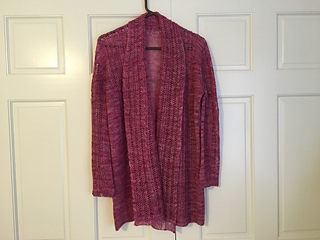 Cardigan is knit in pieces from the hem up. 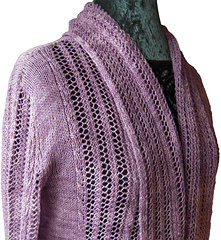 Lace panels are knit with each front, and are worked as an applied border from the top of the shoulder to the back of the neck, after back and front shoulders are joined. The lace pattern is mirrored (chiral) on right and left front panels, except that all lace-related decreases are k2tog for simplicity.